When most people think about places to find dinosaurs in the United States, they consider Montana, Colorado, and the mid-West. They don't think of Connecticut. But Connecticut actually has one of the largest on-site dinosaur trackways in the world, just off Interstate 91. In August 1966, an alert bulldozer operator, excavating a building site in Rocky Hill, noticed six large three-toed footprints on a slab of rock. Within a month, the site had been preserved as a state park after more tracks were uncovered by careful excavation. Eventually, paleontologists located 9,000 square feet of trackway, containing 2,000 footprints over 200 million years old. Most of the Jurassic-age tracks were preserved and reburied, with 500 footprints left uncovered for viewing. Two years later, Dinosaur State Park, registered as a National Landmark with National Park Service, opened to the public. In 1975, a permanent dome over the tracks replaced the Original temporary structure, and the interior was updated in 1986 and again in 1996 to its present configuration. Outside the dome, 2 miles of nature trails wind through swamp, forest and meadow. And in a small area, surrounded by a half-wall, is the track casting area. Five prints (four reversed and one indented footprint) sit out in the open. Visitors can touch them, photograph them...and make plaster casts of them. The reversed prints are actually the upper layer of the fossil footprints. Making a cast of these results in an indented plaster footprint. The traditional, indented footprint makes a raised impression, almost like a dinosaur's foot. The park provides the footprints, the metal rings, and water. Visitors are instructed to bring vegetable oil, rags, a 5 gallon bucket, and 10-15 pounds of plaster of Paris. Howeyer, we found that many people had left behind extra rags, oil, and buckets. 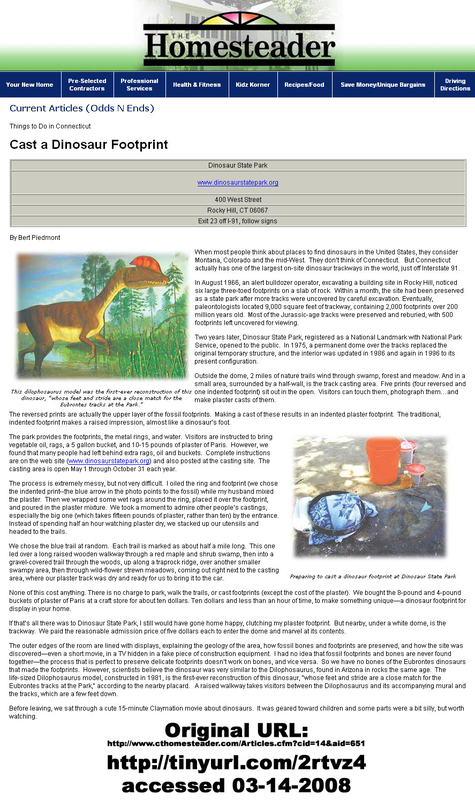 Complete instructions are on the web site (www.dinosaurstateparkorg) and also posted at the casting site. The casting area is open May 1 through October 31 each year. The process is extremely messy, but not very difficult. I oiled the ring and footprint (we chose the indented print--the blue arrow in the photo points to the fossil) while my husband mixed the plaster. Then we wrapped some wet rags around the ring, placed it over the footprint, and poured in the plaster mixture. We took a moment to admire other people's castings, especially the big one (which takes fifteen pounds of plaster, rather than ten) by the entrance. Instead of spending half an hour watching plaster dry, we stacked up our utensils and headed to the trails. We chose the blue trail at random. Each trail is marked as about half a mile long. This one led over a long raised wooden walkway through a red maple and shrub swamp, then into a gravel-covered trail through the woods, up along a traprock ridge, over another smaller swampy area, then through wild-flower strewn meadows, coming out right next to the casting area, where our plaster track was dry and ready for us to bring it to the car. None of this cost anything. There is no charge to park, walk the trails, or cast footprints (except the cost of the plaster). We bought the 8-pound and 4-pound buckets of plaster of Paris at a craft store for about ten dollars. Ten dollars and less than an hour of time, to make something unique�a dinosaur footprint for display in your home. If that's all there was to Dinosaur State Park, I still would have gone home happy, clutching my plaster footprint. But nearby, under a white dome, is the trackway. We paid the reasonable admission price of five dollars each to enter the dome and marvel at its contents. The outer edges of the room are lined with displays, explaining the geology of the area, how fossil bones and footprints are preserved, and how the site was discovered�eyen a short movie, in a TV hidden in a fake piece of construction equipment. I had no idea that fossil footprints and bones are never found together�the process that is perfect to preserve delicate footprints doesn't work on bones, and vice versa. So we have no bones of the Eubrontes dinosaurs that made the footprints. However, scientists believe the dinosaur was very similar to the Dilophosaurus, found in Arizona in rocks the same age. The life-sized Dilophosaurus model, constructed in 1981, is the first-ever reconstruction of this dinosaur, "whose feet and stride are a close match for the Eubrontes tracks at the Park," according to the nearby placard. A raised walkway takes visitors between the Dilophosaurus and its accompanying mural and the tracks, which are a few feet down. Before leaving, we sat through a cute 15-minute Claymation movie about dinosaurs. It was geared toward children and some parts were a bit silly, but worth watching.